I LOVE cilantro. Love. It’s my favorite color (not that that’s unique), and it just smells so fresh and amazing. It smells like warm weather and sunshine. And anyone who knows me knows how I feel about warm weather. And hot weather. Oh yeah, and it tastes fantastic too. So I made it into a pesto and added some bite–tequila! 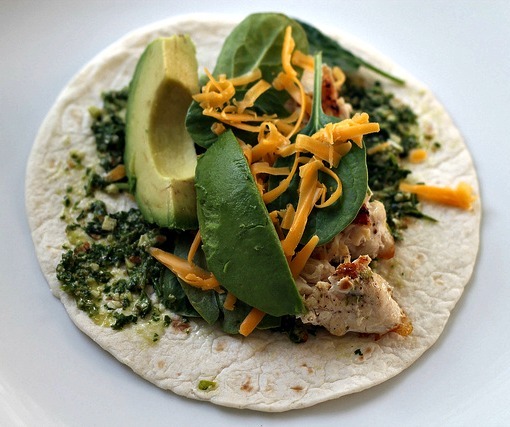 This particular evening I slathered it on tortillas to make “green tacos” with chicken, spinach, and avocado. But I could also see covering some chicken with it whether baked in the oven or cooked on the grill. Or on pizza. Or pasta. You know, the usual pesto recipients. Depending upon what you want to use it for, just adjust the amount of olive oil or use reserved pasta water to create the consistency you want. If I wasn’t hoping a certain toddler was going to partake in the pesto (no, he didn’t have any–no tequila for this two year old! ), I would have also added in some chile pepper. Although, as long as I glob sour cream on it I don’t think he would care…. If you want to be super fancy, toast those almonds in a dry skillet on the stove until fragrant. 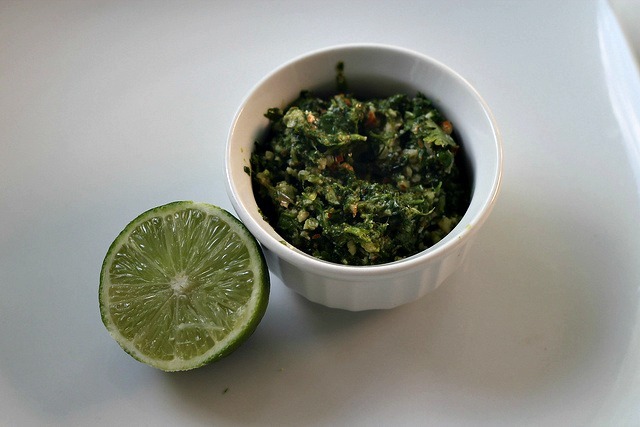 Toss the cilantro, almonds, garlic, salt and cayenne into a food processor and pulse. With the processor running, stream in the olive oil, lime juice and tequila. Taste and adjust seasonings, tequila, or oil accordingly. This entry was posted in Appetizer, Entree, Side and tagged chicken, cilantro, grill, pasta, tacos by intoxicatingeats. Bookmark the permalink.